Alpine Communications is hosting a food drive for the Clayton County Food Shelf now through Christmas. 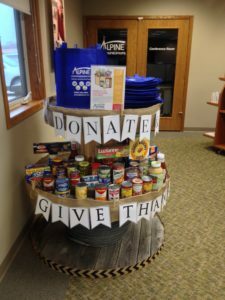 Please visit Alpine Communications in Elkader to pick up an Alpine grocery tote and then fill the tote with non-perishable food or personal items or for our holiday food drive. The Clayton County Food Shelf is in need of items such as peanut butter, tuna, canned fruit, flour, sugar, vanilla, and cereal as well as other non-food items including diapers, personal care products, soap, toilet tissue, shampoo, laundry soap, etc. As an added bonus, Alpine Communications customers who make a donation will be entered into a drawing for an Alpine gift package. Call 563-245-4000 for details.